Encompassing a broad swath of Scotland, stretching from Inverness north to Thurso, Scotland's spectacular Highlands are separated from the rest of the country by the "Great Glen," Glen More. This ancient fault line was used to create the remarkable Caledonian Canal, extending from the west coast to the east, from Loch Linnhe to the Moray Firth, and taking in magnificent Loch Ness along the way. While much of this mountainous region is uninhabited (and therefore excellent for hiking and biking adventures), it does boast many lovely small towns and villages. One of the top things to do is drive along the coast to the pretty seaside town of Dornoch, noted for its cathedral and castle ruins, as well as its Royal Dornoch golf courses. 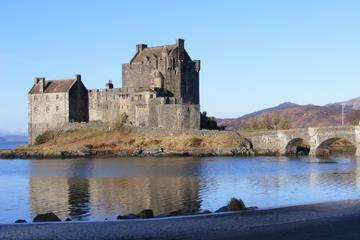 The Scottish Highlands' castles are some of the major tourist attractions. At the top end is John o'Groats, home to Scotland's most photographed signpost: it famously includes distances from here to Lands End in Cornwall at the southernmost tip of England (1,406 kilometers), as well as "Your Town" (you can add letters to spell out the name and mileage to your hometown). Find the best places to visit in this ruggedly beautiful region with our list of the top attractions in Inverness and the Scottish Highlands. A great place to begin exploring Inverness is in the grounds of lovely Inverness Castle. Although only the north tower of the castle is open to the public, this old sandstone building does provide an imposing (and photo-worthy) backdrop overlooking the River Ness. After sightseeing, head to the Inverness Museum and Art Gallery with its displays about the city's rich cultural heritage, as well as the history of the Highlands. The late 19th-century Neo-Gothic St. Andrew's Cathedral stands opposite Castle Hill on the banks of the River Ness and is well worth a visit. Another notable attraction is Abertarff House, Inverness's oldest building dating from 1592. The Titanic Inverness Maritime Museum is a fun attraction as a small interactive maritime museum with nautical-themed displays, including the world's largest model of the ill-fated Titanic (1:10 scale). Also worth a visit is the pleasant Inverness Botanic Gardens. Finally, wrap up your walking tour of Inverness with a little shopping or a beverage at the attractive old Victorian Market, an indoor shopping arcade built in 1890. Located an easy (and scenic) 30-minute drive southeast of Inverness city center, Loch Ness is must-visit when exploring the Scottish Highlands. Famous the world over as the supposed home of "Nessie" the Loch Ness monster, this picture-perfect freshwater lake is also home to one of the country's most iconic fortresses: Urquhart Castle. Although now just ruins, it's easy to picture just how magnificent this castle once was. In addition to superb exhibits dealing with the castle's rich history, the site also boasts a great café with stunning views over Loch Ness, as well as a gift shop. For more on the mythical beast that inhabits the lake, visit the Loch Ness Centre and Exhibition, with its fascinating displays relating to the monster and the surrounding area. Given its popularity as a major Scottish tourist destination, Loch Ness is well served by organized tour operators. One of the best for those based in Edinburgh is the Loch Ness and the Highlands Small Group Day Tour. Highlights of this great trip north include a visit to Fort William; Linlithgow Palace; the country's tallest mountain, Ben Nevis; and, of course, Loch Ness itself, where you'll have the chance to hop aboard a boat and explore the lake from the water (transportation and tour guide included). If you're based in Inverness, a similar day-long tour option takes in both Loch Ness and Culloden Battlefield. Highlights include a very personal experience (only eight guests are included), the services of a professional guide, and transportation. It was in Culloden on April 16, 1746, that the last great battle was fought on Scottish soil and the fate of the Stuarts - and Scotland - was determined. The historic site's visitor center is a must, with its first-hand accounts of the battle, a 360-degree film realistically portraying the day's events, and spectacular rooftop views of the battlefield. Also of interest are the gravestones of the Scottish clans, as well as the six-meter-high Memorial Cairn erected in 1881 to commemorate the battle. Other landmarks include Old Leanach Cottage and the Cumberland Stone commemorating the spot where the Duke of Cumberland issued orders to his troops. The battlefield is strewn with memorials bearing witness to the dead, including the Keppoch Stone indicating the location where Alastair MacDonell, head of the Keppoch clan, fell. Another recalls the Irish Wild Geese (mercenaries in the service of the French crown who fought on the side of the Highlanders), while the "English Stone" commemorates those who fought alongside Cumberland. A great way to learn more about the history of the battle - while taking in a variety of other beautiful Highland film locations - is to join the popular Diana Gabledon's Outlander Experience Tour. Starting in Inverness, these private full-day tours include a dedicated professional guide well-versed in Scotland's history (and the TV series), and take in top tourist attractions such as the battlefield and the Clava Cairns, as well as Loch Ness and Urquhart Castle. This first-rate tour includes pickup from your hotel and round-trip transportation. Cawdor Castle, just 16 kilometers northeast of Culloden, is famous as the place where William Shakespeare's version of Macbeth murdered Duncan. Although not historically accurate (Duncan was in fact murdered by Macbeth at the Battle of Elgin), it's a wonderful place to visit with its large collection of Shakespearean literature and fine period furniture. A hawthorn tree dating from 1370 acted as a sign to the first Thane to build a castle here, and today the lovely grounds of this fairy-tale garden, with its colorful flowerbeds, are well worth a visit, as are the nature trails and nine-hole golf course. A quaint cottage on the grounds is available for rent for those looking to really soak up the ambience of this historic castle and estate. Also of interest is nearby Fort George, a huge artillery fortress built after the Battle of Culloden to keep the defeated Highlanders in check. Besides extensive military installations, the fort also houses the regimental museum of the Queen's Own Highlanders. Located about 61 kilometers east of Inverness on the road to Aberdeen, Elgin has a number of historic attractions worthy of a visit. After centuries of plundering, what's left of Elgin Cathedral's tower hints at the former splendor of the 95-meter-long "Lantern of the North," as the church was known. Other features still visible include the west facade, the 13th-century choir, the great east rose window, and the octagonal chapter house. Daily guided tours are available and are well worth joining. Elgin is also home to Scotland's oldest church, Birnie Church, which dates from 1140. Other tourist sites of interest are Spynie Palace, with its massive David's Tower built in 1470; Duffus Castle, a fine example of a Norman motte and bailey castle; and Brodie Castle and Country Park, seat of the Brodie family since 1160 and home to fine French furniture from the 18th and 19th centuries, Chinese porcelain, and a notable collection of paintings, including works by French Impressionists and English and Dutch artists. Your tour around the extensive grounds should include a visit to the 1.8-meter-high Pictish Rodney Stone, carved with Celtic animal symbols and inscriptions. Loch Maree is a deep Pleistocene valley that serves as a habitat for otters and black-throated divers, and is a big draw for hikers due to its nature trails and campsites. The more demanding mountain trail, a six-kilometer circular tour, offers an unforgettable view over Loch Maree and the majestic mountains that make this part of the Highlands so popular. Other nearby highlights include Victoria Falls, a waterfall near Shatterdale named after Queen Victoria (she visited the loch in 1877). It's also a popular fishing location, too, with fun excursions (along with scenic boat rides) available to tourists. The attractive village of Gairloch is another scenic stop on the Highlands' tourist route and lies in a sheltered sandy bay. Along with its nine-hole golf course, there's also the Gairloch Heritage Museum with its displays detailing the cultural and economic development of the area from the Stone Age to the present day. The subtropical Inverewe Garden and Estate overlooks a sheltered bay by Loch Ewe near Poolewe (eight kilometers north of Gairloch) and has thrived here thanks to the area's mild climate. Osgood Mackenzie was only 20 years old when, in 1862, he proved that plants from distant lands could survive on the poor Torridon sandstone and acid peaty soil if it is enriched by loam from the coast and the wet peat was drained. Highlights include rhododendrons, azaleas, and magnolias, eucalyptus from New Zealand, Japanese ferns, Himalayan lilies, South American water lilies, giant forget-me-nots from the South Pacific, rock gardens, ponds, Scotch pines, and rare varieties of palms. Guided walking tours are available weekdays. Be sure to also pop into the Sawyer Gallery, which hosts art and crafts-related exhibits throughout the year. Some of the Highlands' most stunning scenery is to be found 35 kilometers north of Ullapool around beautiful Loch Assynt. This unforgettable picture-book landscape is famous among anglers for its salmon and trout fishing, as well as its majestic mountain panoramas. At the eastern end of the loch stand the ruins of Ardvreck Castle, built in 1590 for the MacLeods and later run by the MacKenzies and Sutherlands. Other historic ruins include a kiln barn and mill, as well as the remains of an ancient chambered cairn. Also nearby is Inchnadamph Nature Reserve, home to Scotland's largest network of caves; Loch a'Chairn Bhain's seal colony; and the 200-meter-high Eas a Chual Aluinn Falls, Britain's highest waterfalls. Mainland Scotland's most northwesterly point, Cape Wrath offers up some of the most remarkable views over the North Atlantic toward the Orkney Isles. It's also one of the wildest parts of the Highlands, full of interesting geological features and steeped in maritime history. One of the few man-made structures in the area is the lighthouse built by Robert Stevenson in 1827 on the spectacular Clo Mor Cliffs. The area is also popular among bird-watchers, and for hikers, numerous trails crisscross the area, including some leading to lovely Loch Nevis. Only a mile northeast of Golspie stands imposing Dunrobin Castle, seat of the influential counts and dukes of Sutherland who, by the end of the 19th century, owned more land than any other landowner in Europe. The castle itself was begun in 1275, although much of the neo-Baronial style seen today dates from the mid-19th century. The attractive corner towers with their conical slate roofs lend a distinct fairy-tale look reminiscent of the famous Loire Valley chateaux in France. Of the castle's 189 rooms, the Drawing Room stands out as a highlight, with its Louis XV-style furniture, fine portraits, and 18th-century tapestries. The extensive Italian-style gardens are ideal for a stroll and also offer fine views over the Dornoch Firth. If there's time available in your Highlands travel itinerary, linger a little longer for one of the castle's regular falconry shows. There's also a first-rate tea shop on-site serving traditional high tea. While the Orkneys are popular with walkers, nature lovers, bird-watchers and anglers, there's also plenty of interest for more traditional tourists, including its famous prehistoric sites. Two of the most famous are Maes Howe Chambered Cairn, Britain's best-preserved Stone Age burial chamber dating from 2500 BC, and the Skara Brae Prehistoric Village, an open-air museum with well-preserved houses and remnants of Stone Age furnishings. Of the 67 Orkney islands, only 18 are inhabited, and many of the others serve as breeding grounds for seabirds, kestrels, peregrine falcons, sparrow hawks, and golden eagles. Kirkwall, the largest town, has a number of historic sites of interest, including St. Magnus Cathedral, reminiscent of the cathedral in the Norwegian city of Trondheim (Norway once owned these islands); the 12th-century Bishop's Palace, in which Norway's most famous King, Haakon, died in 1263; and the ruins of Earl Patrick's Palace, one of the finest examples of 16th-century Scottish secular architecture. Hikers and mountain bikers alike enjoy exploring the Shetland Islands, as do water sports enthusiasts, who can choose to play on more than 350 lakes or the vast Atlantic Ocean. The lochs, well stocked with brown and rainbow trout, are a paradise for fly fishermen, and there are also many opportunities for deep-sea fishing. For golfers, the chance of a round at midnight on Britain's northernmost golf course is irresistible, and bird-watchers are drawn to Fair Isle, Mousa, Noss, and near Herma Ness to watch Arctic terns; shearwaters; razorbills; gannets; and the amusing puffins, known here as "Tammy Noirie." Shetland consists of nearly 100 islands, together forming the northernmost outposts of the British Isles (it's 160 kilometers from the mainland and on the same latitude as the Norwegian city of Bergen). 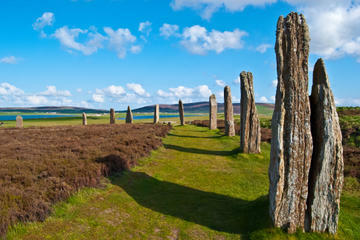 Other top things to do on the Shetland Islands is visit the many spectacular Stone Age sites, the best of which is the Jarlshof Prehistoric Settlement, a fascinating complex that includes Bronze Age roundhouses alongside Viking longhouses. The Best of Bonnie Scotland: The stunning Isle of Skye is the easiest of Scotland's islands to access. Connected to the mainland by road, it's definitely worth spending a few days exploring its many old castles, prehistoric sites, stunning scenery, and ample wildlife. So, too, is lovely Loch Lomond, home to countless great hiking trails through the Trossachs National Park. The town of Oban is also a magnate for hikers and climbers, drawn here to scale the impressive Mount Etive overlooking pretty Loch Etive. Scottish City Experiences: The Scottish capital of Edinburgh offers no end of great things to do for tourists. Must-see attractions to explore include magnificent Edinburgh Castle, the Royal Mile, and the Queen's Royal Yacht Britannia. The industrial and cultural city of Glasgow is also worth visiting, and is home to a stunning cathedral and many fine art galleries and museums. Closer to Inverness is Aberdeen, a scenic two-hour drive away but well worth it for its ancient cathedral and splendid historic architecture. Scotland Vacation Ideas: Tucked away in the southwest of Scotland, the cities of Ayr and Dumfries are best known for their connections to the famed Scottish poet Robbie Burns, where a museum has been set up in his birthplace. Other top-rated destinations to include in your Scotland itinerary include Dundee, popular for its amazing rail bridge and marine museum, and St. Andrews, home to the world's best known golf course.